The more crime that occurs along a student’s way to school, the higher the likelihood that student will be absent, Johns Hopkins University researchers found. 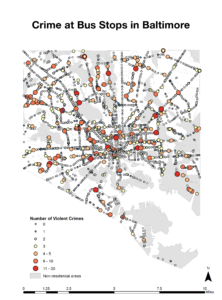 By modeling the most efficient routes to school for Baltimore students, researchers found those who commute through areas with double the average amount of crime are 6 percent more likely to miss school. Even more crime-ridden routes to school led to proportionately more absenteeism. The findings, which demonstrate yet another way urban violence effects school outcomes, appears today in the journal Sociological Science. Researchers including Burdick-Will have shown that students exposed to violent crime have lower test scores and lower graduation rates. And chronic absenteeism has been linked to lower achievement, student disengagement and increased risk of dropping out. Meanwhile families, especially those living in violent and disadvantaged neighborhoods, are increasingly choosing to send their children to schools in different parts of town. But getting to these schools is often difficult. Many districts have cut back on traditional school busses and students must use public transportation. This means just showing up to school every day can mean long and difficult journeys through potentially dangerous streets, Burdick-Will says. This is the first time anyone has attempted to gauge how neighborhood violence might influence school attendance. Researchers first determined the quickest, most efficient route to school using public transportation for 4,200 first-time 9th-graders in Baltimore City public high schools. Then they linked those streets with crime data from the Baltimore Police Department. The team found that students whose best route required walking or waiting for a bus in areas with higher violent crime rates had higher rates of absenteeism throughout the year. And the scary spots weren’t limited to certain parts of town — they were essentially all over the city. The average student went to school in a neighborhood where 87 violent crimes were reported during the academic year, but lived in a neighborhood where 95 violent crimes happened during the same time. Students pass streets on public transit where 41 violent crimes happened and passed streets on foot where there were 27 such crimes. The relationship between exposure to violence during the commute to school and absenteeism provides important insights into the ways urban violence links to low achievement and high school dropout, the researchers conclude. Not only are students stressed and traumatized by violence in their communities, they say, they’re missing school because of it. Co-authors included Marc Stein, an associate professor in the School of Education; and Jeffrey Grigg, an assistant professor in the School of Education. The research was supported by a grant from the Spencer Foundation.